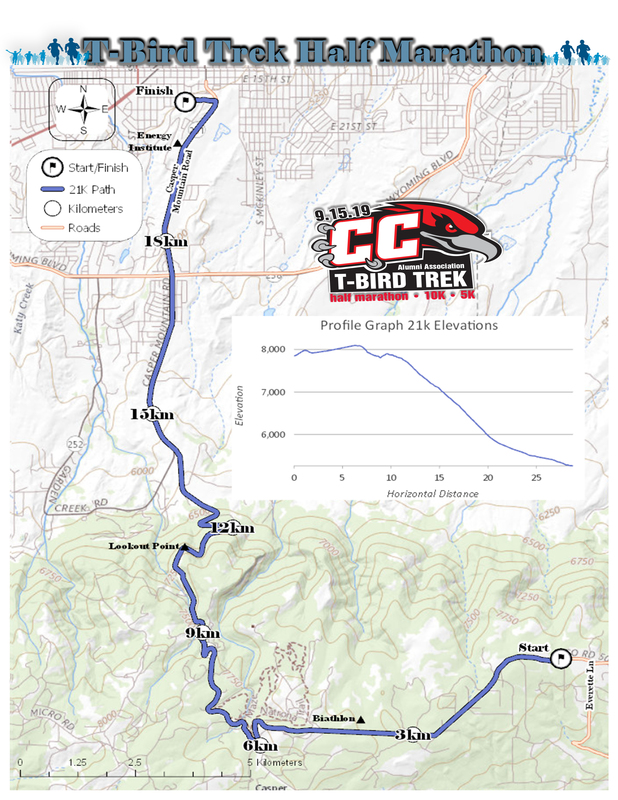 The T-Bird Trek is a race anyone can participate in. There is a 5K on campus that you can run/walk at your own pace. There is a 10k that will get your heart pumping and for a real challenge, the half-marathon will take you up Casper Mountain to enjoy the view while giving you the satisfaction of participating in one tough half marathon. NEW THIS YEAR is a downhill half-marathon. We will give you a ride to the top and you run to the finish line at the Casper College campus. Profits from the T-Bird Trek will support scholarships for Casper College students, institutional grants, and alumni programs. A fun day outdoors can make a difference for a student attending Casper College. There is a crowd to cheer you through the race, delicious breakfast burritos to feed you after your race and band to enjoy while recovering by the fire. Spend a fall morning with us at Casper College and support students while you do it! In addition to the new downhill half marathon course, we will be supporting the Casper College Veterans Club in the first Dog Trek on Saturday, September 14. Stay tuned. Details coming soon. Saturday, September 14, 2019, 12 noon to 4 p.m.